We happily reap what we sow when it comes to our state’s exceptional, award-winning gorgonzola. This rich and creamy Italian cheese, named for Italy’s Po Valley town near Milan, was first made in A.D. 879. Italian immigrants brought its recipes with them to Wisconsin, where our cheesemakers put their own spin on this timeless classic. 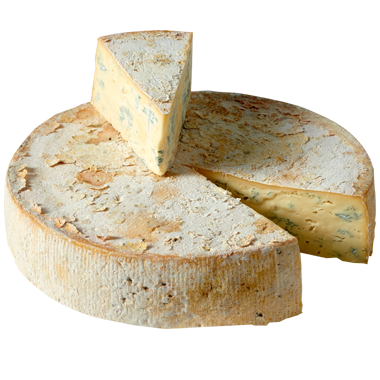 Gorgonzola was one of our country’s first blue cheese loves, so it makes sense that we’d make ours so memorable. In every possible way. Wisconsin gorgonzola melts easily and assimilates quickly into mayonnaise, butter and sour cream for tasty dressings, dips, spreads and sauces. We really like it at room temperature in full-flavored salads, and as the loudest and proudest star of the cheese board drizzled in honey. Nothing but big flavor all-around for heavyweight gorgonzola. For beer, pair it with stout, porter and Belgian ales. Wines that match gorgonzola’s boldness include cab sauv, chianti, pinot noir, merlot, red zinfandel, riesling and malbec. If you want a sipper with your gorgonzola, we recommend port, madeira, scotch, tequila reposado, tequila anejo and definitely mescal. Gorgonzola is happiest with foods seeking a high-protein flavor punch. Toss it crumbled with hot pasta and assertive wilted greens, or stir it into mashed potatoes. Fresh figs, dates and dried apricots all like to hold hands with this bold blue. Our personal favorite: Spread gorgonzola crumbles into butter, and use it as a strong, melty, pour-over topper for grilled or broiled meats.